Wow! This exquisite soup is courtesy of Szos and Jenny from the Recipe Club and let me tell you, it is simply perfect. Wholesome, filling, delicious, and full of fibre, nutrients and flavour. Fall weather is here, time to make some soup! While the soup is cooking, combine tahini, flax and Bragg's in 2 dinner bowls; mix until texture is smooth and creamy. When the soup is ready, puree with a hand blender (or transfer to a blender and puree)* then ladle into bowls. Mix the soup with the tahini dressing really well. Serves 2 hungry adults. Delicious with chapatis on the side. 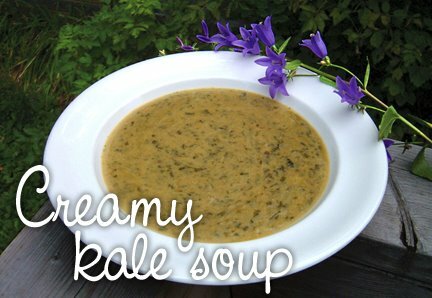 *If more texture is desired, skip the hand blender (or blend only half the soup) and serve. I made this soup last night. I used Rappini greens (since they were on sale) and mung beans for instead of french lentils and basmati rice since I was out of the other grains and it was delish! Liquid amino's ... is that similar to Tamari? Excellent soup! I modified it a bit, bit it was still lovely!